Rattlesnakes are undoubtedly intriguing reptiles, but at the same time, highly intimidating. 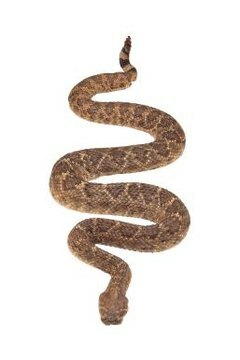 The rattlesnake world includes two different genera -- Sistrurus and Crotalus. Approximately 30 species of rattlesnakes exist, all of which inhabit the Americas. Rattlesnakes are particularly prevalent in the United States' southwestern area. When it comes to self-defense, these snakes know what they're doing. Rattlesnakes might seem like tough guys, but even they are susceptible to occasional predation by other animals -- think coyotes, hawks and eagles, for a few examples. They often try to protect themselves from catching the attentions of others by keeping still, all the while trying to mix in with their environments, camouflage-style. Rattlesnakes don't only use camouflage to hide from menacing animals, but also to stay low-key when focusing on acquiring prey animals themselves. Some rattlesnakes defend themselves against animals simply by running away from the scene, or at least getting shelter in a covert place. When rattlesnakes run away, they are often silent about it -- no major commotion or fanfare there. Rattlesnakes frequently try to protect themselves from approaching animals by issuing clear "back off" signals. These tip-off signals include expanding their physiques in attempts to come across as bigger and more threatening, hissing and even clattering their tails -- courtesy of their rattles. This clattering or rattling sound has a simultaneously shrill and whirring quality. If you ever witness a rattlesnake engaging in any of these behaviors, be extremely careful and stay away. These pit vipers tend to caution animals prior to going for their painful bites. However, they sometimes react extremely swiftly to danger, particularly when they're in the midst of activities such as shedding and reproduction. They generally limit biting for situations of extreme peril. Although many rattlesnake bites are venomous, they don't necessarily give off the venom every single time. In any case, if you are bitten by any type of rattlesnake, get emergency medical assistance immediately. Quick medical care can mean the difference between life and death, so take it seriously. Remember, rattlesnakes do not reserve their defensive mechanisms for animals alone, and sometimes use them on humans, too. Despite that, they for the most part prefer to stay far away from people.